A feature in Target Dashboard that is often overlooked is the Table Summary. We wanted to change this, and decided to give it an upgrade that would allow it to come into its full potential. At its most basic, the Table Summary will do exactly what it says – it will provide a summary of your data in a dashboard item that you can insert into your dashboard to give more detail to, or show the raw data behind a chart, gauge or scorecard. 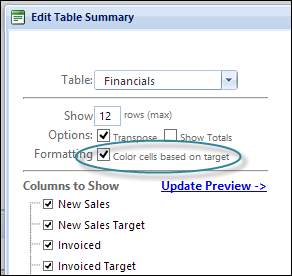 In the most recent update of Target Dashboard (June 4, 2013), we added the capability to turn your table summaries into heat maps that colour codes the cells of your table based on their value in relation to a target set by the user. This requires a target column to work since the colour coding needs a point of reference to be able to determine what values are good or bad. Only columns that have a target set up will be colour coded. You can read more about how to set up a target column here. Enabling the option to colour code your table summary is as easy as a click of the mouse. We can now clearly see that the target was not met during this time period at a glance, and take action right away. You can also choose not to show the target column in your table summary. If you have the option to colour cells based on target selected, your table summary will still be colour coded, and you will end up with something more along the lines of a traditional heat map. This will make it even easier to spot trends and patterns, and it’s a very effective way of getting an overview of your data at a glance. It adds another dimension to the table summary that allows it to become more of a standalone feature on your dashboard, and not just a companion to the other dashboard items. Imagine using these new and improved table summaries as heat maps for sales performance, or to get a quick overview of where you stand against your SLAs – the potential is huge, and we here at Target Dashboard are positive that you will find ways of using this new functionality that we haven’t even thought of yet, so head over to your Target Dashboard and give it a try! As always, if you have questions, feedback or need a helping hand, contact us on support@targetdashboard.com.